​Producer of this festival and many other events and celebrations for women. She developed and coaches women and girls in the "Makom B'Maagal" method, which facilitates harmonious and joyful creative expression circles using movement, rhythm, and voice. Aviva is passionate about connecting women together so that we can help each other to move deeper into connection with ourselves, each other, and haKadosh Baruch Hu. Chinese Medicine Practitioner, Detox Specialist, Mother of 4 and the Business Advisor Extraordinaire for the Festival. Her vision: Trading hierarchy and competition for mutual support and love, a circle where everyone has her place, and space, to be herself. ​Recording Artist, Music educater and mother of 2- She just released her first album-- a work of love and passion! She is so excited to share it with you! ​ A professionally trained classical violinist, and recording artist, she has performed all over the world. She lives on a hilltop outpost and homeschools her 2 large handfuls of children. "Halleluhu" is her latest project which is furthering her goal to perform uplifting music that inspires one to direct ones heart to God, to dance, and to spread the light and name of Rebbe Nachman, to hasten the final redemption. mother of 14, savta of many delicious grandchildren! Learned with Reb Shlomo Carlebach for 20 years & still transcribes his torahs & loves to share these deep soul-heart teachings that reconnect us to the higher worlds within us! bringing home our lost and exiled parts in preparation for Mashiach. Energy healer and Reflexologist. Mother of 6 awesome kids! 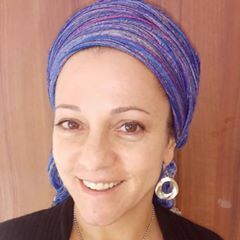 Maskit will be leading us for the 4th year in partner water healing: learning to relax and "birth" into our "light bodies"
Chana Frazin is a certified Aromatherapist living in the Golan Heights with her husband and 4 spirited children. Chana's passion is to help women care for their families using essential oils for physical and emotional well being. She gives workshops throughout Israel and North America to empower women as healers in the home. Gitty loves to create and express movement that flows out from within, as a pure connection to oneself and Hashem and to use that powerful movement to bridge beyond our differences with fellow soul sisters. Through dance we can empower ourselves in our journey towards Geula. ​Tzipporah Sarah Eizen is a certified yoga and Nia instructor who is passionate about the expressive arts, music, movement, body-centered living and holistic health. She believes dance an yoga are extraordinary wellsprings for cultivating JOY and mindfulness in life and enjoys sharing her love of movement to help others feel better! Rivka Adina Kanush: DJ extraordinaire! Rivka Adina is an entertainer, dancer and singer and owns with her husband Holy Simcha Entertainment: DJ-ing at bat mitzvot and weddings-- She gets the house rockin'! Dena Hundert recently made Aliyah from Montreal where she was Rebbetzin on campus - taught, danced with and inspired hundreds. She is a certified Zumba and Fitness Instructor, Certified Personal Trainer, and Bas Mitzva Entertainer. Dena's passion in life is to teach and promote a healthy and authentically Jewish balance between body and soul. Dena selects inspirational, funky Jewish Music to get the crowd moving and grooving in an awesome workout while simultaneously remaining connected to their essence as the words penetrate to their core. Come try Dena's Zumba for your Body and Soul! dMichal Oshman: Vision Supporter, Head cheerleader for the Dream Team and the RBS coordinator for the festival. She is an artist living in Ramat Beit Shemesh and loves to dance, dream, and take action with women and girls to bring the Geula. ​Miriam Leah Gamliel is a performer, writer and amateur producer. She brought women together in 2007 to form ATARA: The Arts & Torah Association, to address the needs of performing artists observant of halacha. She values and actively supports creativity and talent development and expression aligned with Torah values. She has most recently been researching the social and emotional needs of creative thinkers while living in Montreal, but this year brought her family to Israel where her husband is learning at Machon Meir. She is so thrilled to finally join the Dream Team!!! Past teachers --- Forever on the Dream Team! Personal Coach helping smart and driven moms (especially coaches, healers and wellness practitioners) who are pulled in different directions, to create better work-life balance so they can feel happier, healthier, and enjoy better relationships. Through her spiritual system and divine connection, they overcome emotional blocks and limiting beliefs that transform overwhelm overdrive and over-giving into more peace, joy, freedom and alignment. As a result, they reach greater levels of well-being for a thriving and integrated personal and professional life. Energy healer, Artist and mother of 3. She strives to live with integrity to her vision of living in harmony with the land and according to the highest ideals of Torah in order to bring healing to her self, family and others and bring the Geula. certified Yoga instructor specializing in Pre-Natal, Post-Birth, and Women of all ages, trained in Persian and Belly Dance since childhood, received a BA in World Arts & Cultures (incl. Folkloric dance traditions from multiple continents) at UCLA, and has studied intensively under Israel's legendary Contemporary Folklore dancer, Orly Portal, over the last six years. Breaking through stigmas surrounding feminine movement and traditional women's dance, Panteha guides dance circles where women are invited to explore their comfort and pleasure in their own bodies, including breath-work and guided imagery, and in celebration with women in the circle. Dancing on the Kinneret, we will root down to the Earth's core, and draw up the Living Waters through our flesh, enlivening our bones and souls from the Foundation/Yesod and up through our Crown/Keter. Yehudit Goldfarb: Yehudit Goldfarb, Ph.D., Eshet Hazon, and Moretaynu, is the founder of Otiyot Khayyot, the Hebrew Letter Movements for Healing and Renewal.She is also a co-founder and spiritual leader of the Aquarian Minyan, a Jewish Renewal community in California and Associate Editor of Agada, the illustrated Jewish literary magazine. She has also taught literature, Jewish mysticism, and T'ai Chi for over twenty years.